Published in the Dover Express, 5 June, 1981. Anticipations as to utilising the fringes of the athletic ground for building land were soon realised. There is Crabble Avenue, extending westward from the railway arch at the foot of Gorse Hill, on one side of the ground, to Crabble Road at the other end in which there is a terrace of houses facing the athletic ground. Then there is Hillside Road, extending up to Bunkers Hill and Bunkers Hill Road. At the corner of Crabble Road and Crabble Avenue, opposite the ground, the Cricketers’ Arms public house was built. Within ten years nearly a hundred houses had been erected in a locality that had but one prior to the laying out of the athletic ground in 1896. Since this book was written in 1906 considerable further development has taken place extending as far as and just beyond the boundary of Kearsney Abbey, changing the area out of all recognition. The road from the athletic ground up to the top of Crabble Hill was only a narrow lane prior to the tramway extension, which was completed in the autumn of 1905. In Lower Road, facing the old Crabble paper mill, and abutting on the worth side of the river, was built Crabble House which was about 200 years old when demolished to make way for modem bungalows in the mid-1960s. A Georgian style house, originally three cottages, it stood in extensive grounds until the building of the railway, the raising of the embankment cutting the grounds in half although a tunnel was cut through under the railway to enable the property owner to reach his land on the other side. Owners included Mr Willsher Mannering, Mr E. P. Coleman, Mr Richard J. Barwick and, in 1876, there lodged at this house a character named Ralph Stott. This eccentric or fraud claimed to be an inventor and he set to work in the grounds to construct what he said was a flying machine, in which he announced that on 9th October, 1876, he would fly from Dover to Calais and back. The “inventor“ claimed that he would utilise a method of neutralising the force of gravity and take to the air in his revolutionary aircraft. The much talked-of machine, however, never made its appearance, and the aerial voyage, which was postponed by a further announcement until 5th March, 1877, was never attempted. All the public were to see were large, wordy posters and pictures, some of which showed Stott sitting in his boat-like contraption. 'After 12 years experimenting I made an apparatus, whereby action and reaction are rendered opposite, but unequal; and continued rectilineal motion is produced without any expenditure of the motive force. In general terms the apparatus consists of a small, strong, light frame in which a peculiar mechanical arrangement is placed and acted on by a spring; this spring is compressed by a screw and wheel, and (when it is desired to put the machine in action) one end of the spring is allowed to press against one end of the frame, whilst its other end presses the arrangement. The nature and effect of the arrangement is such that a great portion of the reaction is destroyed, thus leaving the action (to that amount) unopposed i.e. opposite, but unequal. 'There is no motion of the parts of the machine inter se; pressures only are produced; therefore the spring never relaxes i.e. there is no expenditure of the motive force. But, although there is no motion of the parts of the machine among themselves, still, as opposite unequal pressures exist, the whole machine moves, continues in motion, and that without any expenditure of the motive force. 'In proportion to its power, it occupies much less space than any kind of engine extant. There Is no limit to the size and power of apparatus on this principle; and, as the unopposed action, or motive force, can be pointed in any direction and regulated in intensity, it is applicable to the propulsion or traction of ships, trains, tram cars, and artillery, and to lifting bodies, and, therefore, to aerial navigation and warfare. One most important feature of this discovery is, that any ship provided with such an apparatus as its moving power could not founder; because the horizontal tractive force could in a moment be pointed in an upward vertical direction, and thus prevent her sinking. Can this tact be ignored, or treated with indifference and apathy? I trust not. “The machine which will be used in the above feat is about 450lb in weight, 7ft long, 4ft wide and 5ft high; this weight and size includes everything. There are no wings, aeroplanes, screws, or balloons used, as will be noted from the woodcuts and photographs issued. A careful perusal of the above general description will render it evident, to any scientist or reasoning person, that the secret of the discovery lies in the mechanical arrangement, which destroys a great portion of the reaction of the spring: this is done by means of a law of mechanics and physics at present known only to myself; this law does not nullify, but only modifies, what is already taught by our scientists — the results are quite in accordance with what is already known. 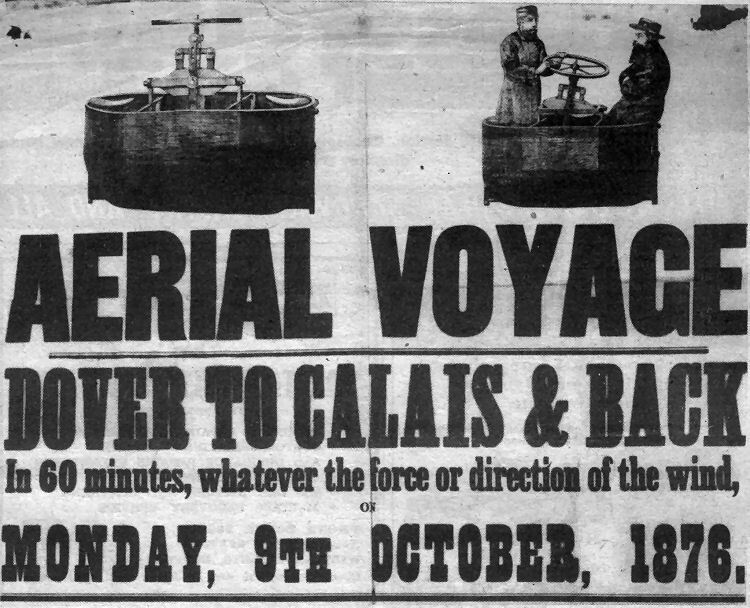 The top half of one of Mr Ralph Stott’s posters for his proposed historic flight across the Channel in 1876, which he proposed to make in a wing-less contraption as illustrated from the vicinity of the Royal Cinque Ports Yacht Club House, on Marine Parade. At the foot of the poster he gave as his agent the name of the club secretary, Parnell R. Maillard. He also wrote that he was bound by an agreement not to sell his discovery (under a penalty of £25,000) for less than half a million pounds. "May I be granted life, health and liberty, be guarded from injury, treachery and robbery and thus enabled to give to the world a discovery involving results beyond our present wildest conceptions,“ his poster message concluded. He claimed that there had been an attempt to rob him of his discovery which he had tried to patent. While in Dover he lodged at Crabble House, River.